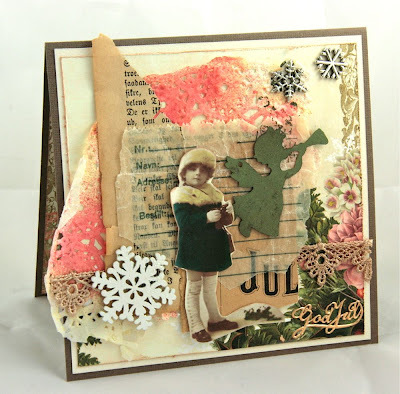 The next Jingle Belles prompt ~ Vintage Style ~ was suggested by the talented Linda Brun; you can check out more of her amazing work on her blog. Linda says, "I have lots of vintage photos and Christmas cards, so I thought Vintage Style would be a great creative theme ... it's a nice way to recycle, and I think the vintage style is perfect for Christmas. Hope you like the prompt and can't wait so see what you come up with." In case you don't have any vintage (or vintage-style) goodies in your stash, Linda has graciously provided scans of two vintage holiday cards from her collection (just right-click with your mouse and save the images for printing or editing). 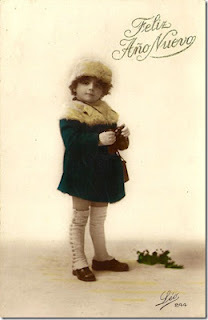 Linda says, "I have used one of the vintage cards I have scanned for you. I love the green jacket the boy is wearing. It looks perfect with the xmas paper from Websters Pages. I cut out the image of the boy and added some layers with vintage paper. Some lace and metal and the card have got the right vintage feel to it. I have also decorated the card on the inside." 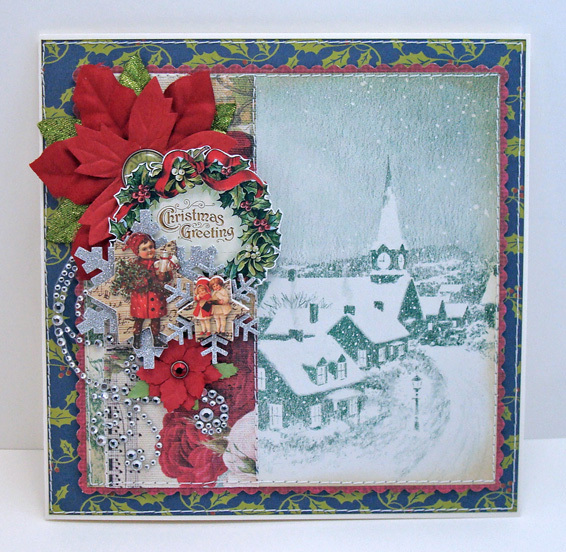 Lauren says, "i found this beautiful snowy church illustration in one of my treasured vintage ideals magazines and combined it with a bunch of cool NEW products made to look quite authentically antique-- like the webster's pages fabric ribbon (thanks leslie! ), some k and co snowflake ornaments, and that gorgeous wreath from the christmas labels collage sheet i won at digital paper shop. i used this week's mojo monday sketch to pull everything together, and i'm quite happy with the result!" Stephanie says, "Last year I bought a pile of scrapbooks at a local estate sale. When I got home and started looking through them, I realized I had stumbled-upon a treasure trove of vintage cards. The scrapbooks belonged to a young lady who apparently saved every card she ever received, including wonderful holiday cards from the 40s and 50s. 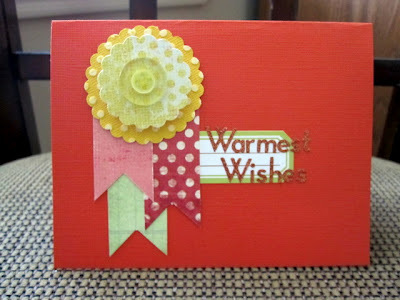 I disassembled the front of one of the vintage cards, adding foam tape to reattach the Greetings sign (and a few adhesive pearls to embellish). I love the wonderful aging of the vintage paper (the left side of the card was covered by another card in the scrapbook, so it stayed lighter than the right side which was exposed to the light). 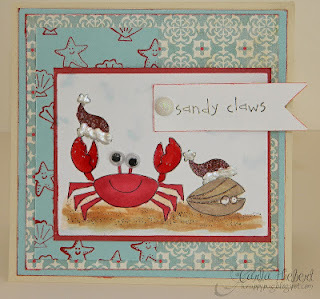 I framed it with several layers of cardstock to keep it clean and simple." 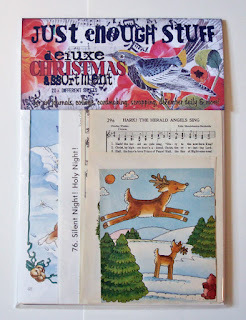 To add a little extra incentive, we have a lovely prize for one randomly selected cardmaker who links up with us this week: a Christmas Ephemera Collage Assortment AND ten dollars worth of products of your choice from Lauren's Etsy Shop, Just Enough Stuff. Lauren has been collecting and crafting with vintage goodies for years, and now you can grab a few for yourself! Why not check out her themed collage packs, eclectic decks of cards, chipboard alphabets, and fun journals, so you'll know just what you'll pick if you're our lucky winner! 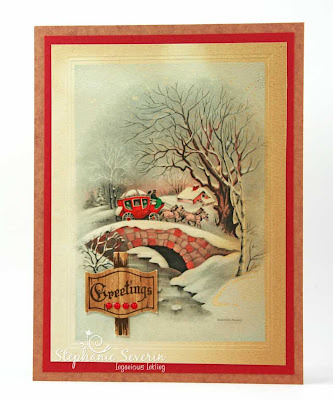 Then dig out your own vintage treasures you've been saving for just such an occasion-- whether genuinely old; or made to look that way; or use one of the fabulous images Linda provided above ... to create a holiday card with Vintage Style. 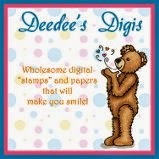 Link-up your creations by 6pm (EST) on Wednesday, July 11th. The keyword for galleries & our Flickr Group is JB-12-14. 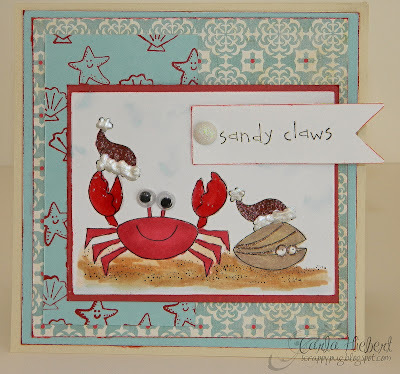 gave beachy keen stamps INSTANT holiday ambience by adding santa hats and the perfect caption; then finished off with a fab combination of papers and great "extras" like googly eyes! packs a whole lot of hawaiian "punch" with just a super-saturated color palette and a stylized sunshine motif, soaking up bonus points for her very clever sentiment! 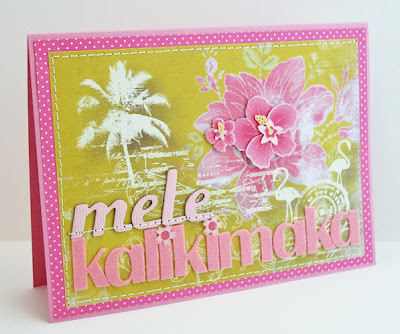 finds a fabulous middle ground with "paradise beach" papers and flowery embossing (elegantly grounded with black) to set a tastefully tropical holiday mood; and we LOVE the dramatic pop of that white embossing! we're still enjoying playing with HOT colors and fun summery motifs this week, so here is a little more inspiration for you. remember, you needn't make YOUR card all-out (or at all!) hawaiian!!! as always, we want you to make this prompt your own, whether that means putting santa on the beach, stringing xmas lights on a palm tree, adding a few hibiscus to your poinsettias, or even just spicing up your color palette with some "tropical" hues. be as bold or as subtle as you like! Lauren says, "one of my favorite souvenirs from our trip to hawaii was a deck of hula girl playing cards which i bought specifically with the intention of using for papercrafts! 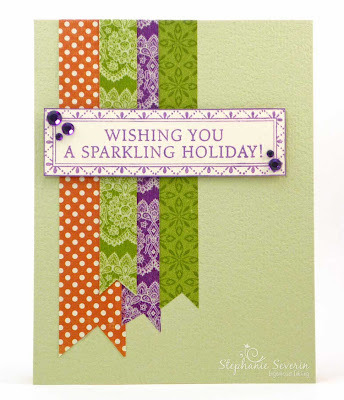 i love the bright colors and fun graphic style and basically built the rest of my card to match, using both holiday products and regular stash... and this week's unscripted sketch #163." Stephanie says, "Another friend of mine visited Hawaii recently, and last week she brought me these adorable holiday gingerbread people and beautiful tropical papers ... the timing couldn't have been more perfect. 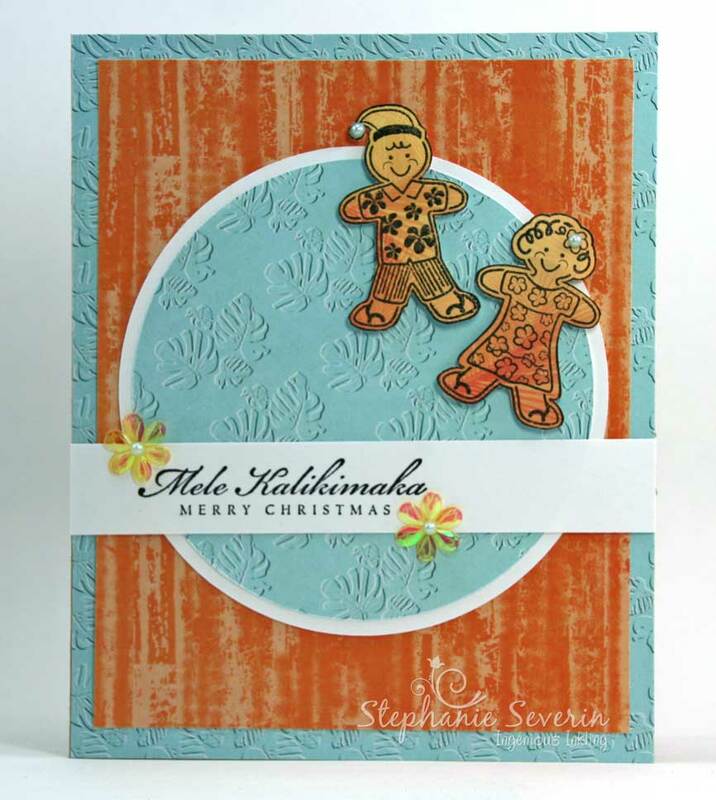 I stamped the gingerbread on orange tropical paper and added blue pearls and a few flowers for embellishments. The layout is June's Sketch for You to Try." 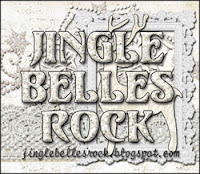 this week's prompt may seem a bit of a stretch, but bear with us for a minute ♥JINGLE BELLES♥! since we're all conscientious enough to make holiday cards year-round (or mad enough, depending on how one looks at it, lol!) then surely the best possible holiday cards to make as the northern hemisphere officially moves into summer are TROPICAL ones, right?! so this week we're asking you to make your holidays hot, hot, hot! you can do this by using bold, saturated colors... or by incorporating tropical flora and fauna like palm trees and flamingos... or by taking santa from the north pole to the beach... OR... well, however you'd like to interpret "hot" or "tropical" in a holiday context! and this month's Hero Arts sketch. adhering it to my card. A few bits of bling finish the design." and now it's time to see what you will do with this summery prompt! 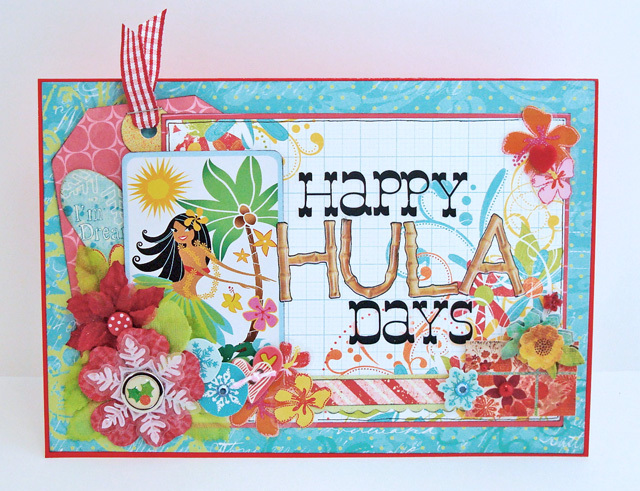 will you go all out with the hawaiian theme... or just spice up your color palette? feel free to use the ideas of "hot" and "tropical" as boldly or subtlely as you like, then come back and link up your caliente creations before 6pm (EST) on wednesday, june 27th. keyword for galleries and our flickr group is JB-12-13. 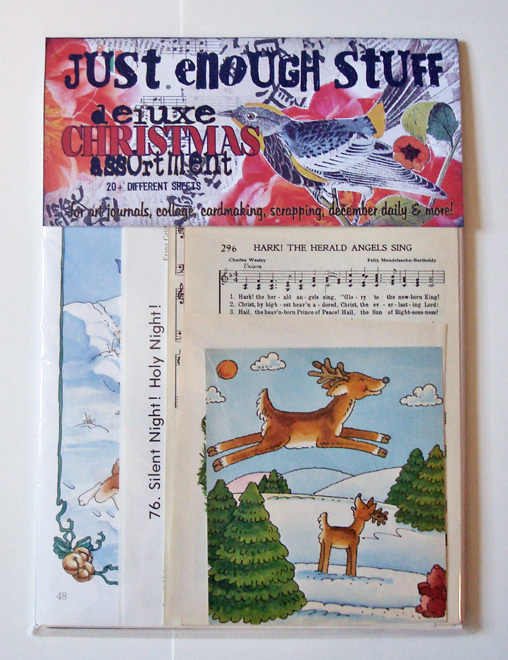 of course we're impressed by what you do every single week ♥JINGLE BELLES♥ but this latest crop of music-based cards was especially wonderful. it seems like every single card was a masterpiece, so we highly recommend scrolling down and cruising through the entire gallery; but in the meantime here are a few selections that really put a song in our hearts! created a glorious symphony of purple, white and black, and chose the perfect embellishments to make this unique and lovely greeting! 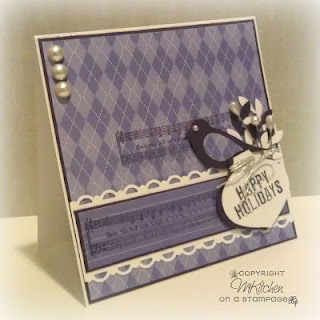 combined four fabulous stamps and one gorgeous non-traditional color (plus a TON of stamping talent!) 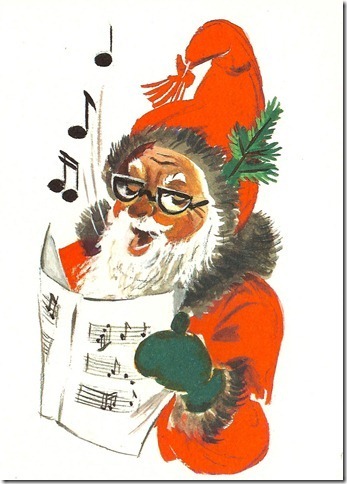 for a card that really sings! 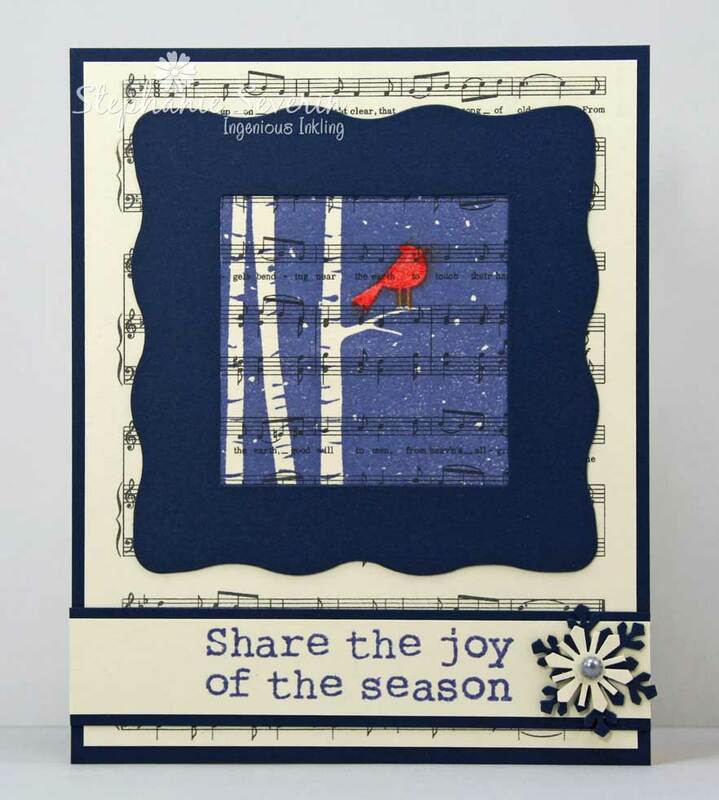 used a stamp wheel with impressive precision to create her ROCKIN' sheet music patterned paper as a background for her adorable christmas caroler! 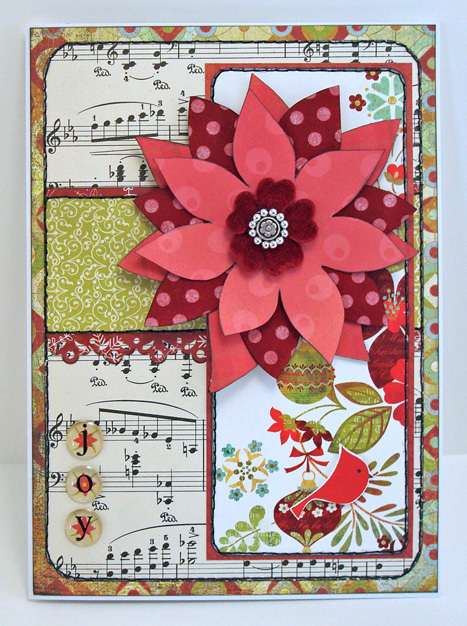 Lauren says, "my all-time favorite way to incorporate music into my cards is to use it like any other patterned paper. i love finding old sheet music at book and rummage sales, and am always on the look-out for different sizes, shapes, paper styles, etc. here i've used a recent deconstructed sketch (#53) and paired the music with a bit of basic grey's lovely packaging, some festive papers, and a giant hand-cut poinsettia." Stephanie says, "I too love to incorporate actual sheet music into my cards like patterned paper ... however, in this case, I wanted to capture the entire song, so I scanned the vintage music (which kept it's aged ivory hue) and sized it to fit my card front before printing. 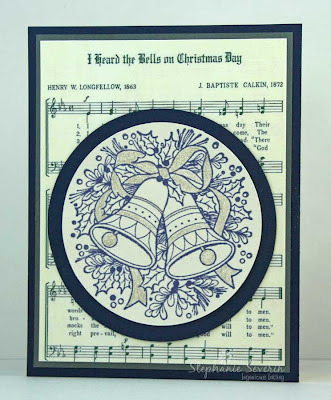 I stamped Hero Arts Cling Wreath with Bells highlighted with silver glitter pen to complete the design. 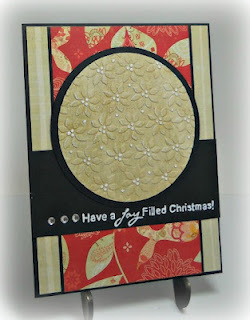 I only had enough navy paper left to cover my card front, so I used a favorite trick and cut my matted circle out of the center of the piece of cardstock ... the other layers cover open circle in the bottom layer." Remember, you have until 6pm (EST) on Wednesday, June 13th (using keyword JB12-12 for our flickr (and other) galleries) to link-up your musically inspired creations.. This week we're celebrating one of our favorite things at jingle belles ... Christmas Music. We're asking you to create a card (or gift card holder, or whatever else you'll be needing for the holidays) that incorporates music, that is inspired by a holiday song, or that includes a holiday song title. 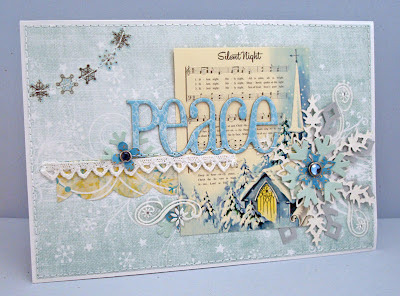 Lauren says, "i built my entire card around a 3x4" sheet music embellishment from october afternoon's holiday style miscellany collection; i loved the soft colors, the charming retro-style and even the magical feeling of christmas snow... so i tried to expand on all of these in my design. i used the may 21st layout sketch at sketch support to guide the placement of my elements, and i'm quite pleased with the result!" 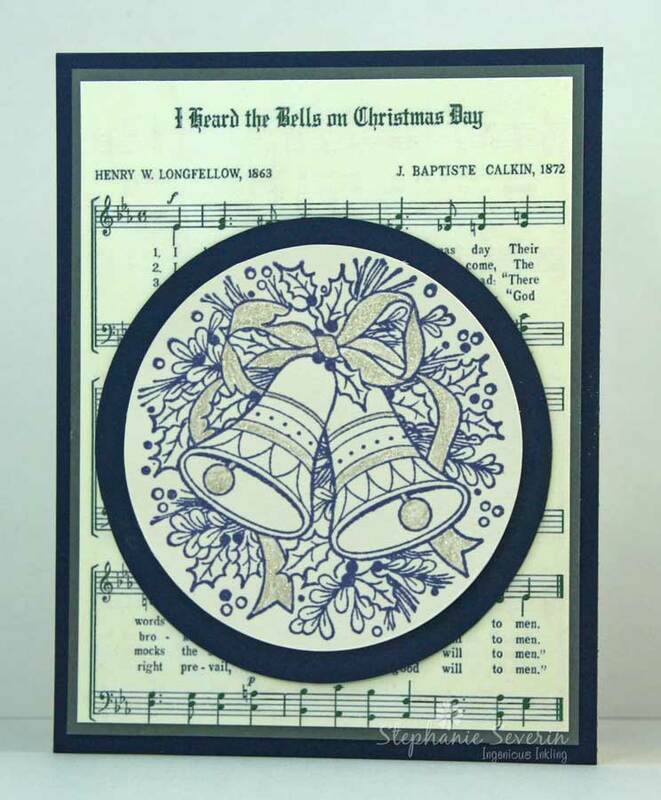 Stephanie says, "I started by scanning some vintage sheet music I had in my collection and re-sizing it for my card front. 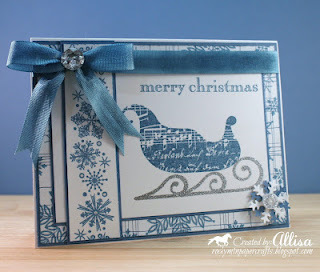 Next I stamped Hero Arts Merriest Christmas Wishes in Blue Iris on the music-printed cardstock. I intended to use the image stamped directly on the music, but managed to flub my attempt at a hand-drawn frame, so I cut out the stamped image and placed it on top of a second piece of the printed music (I always print enough to cover a piece of cardstock) using a blue cardstock frame to cover the flub. 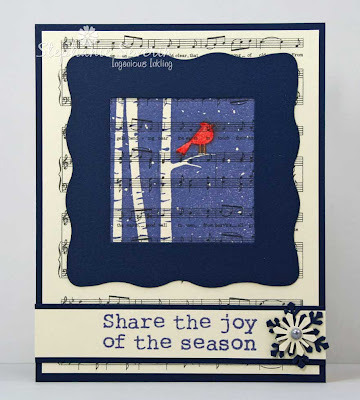 I added red colored pencil to my cardinal for a little pop." If you're stumped, here's a list of Christmas Songs to get your creative juices flowing or put in some holiday CDs and start singing (or humming or whistling) those holiday tunes and link-up your creations by 6pm (EST) on Wednesday, June 13th using keyword JB12-12 for our flickr (and other) galleries.